Back in tab 1, open the messages popup. We should show a more comprehensible error message here. For clarification: there are actually two bugs that are described here: [object Object] appearing instead of a legible API error and the fact we need a comprehensive message for logged out users. Fixing both. @Pginer-WMF and @jmatazzoni, the current commit fixes the described issue -- if a user is logged out before they opened their popup, it will display a helpful message saying they should login. However, this will not do anything (currently by design) if the user already have notifications populated and is reopening the popup. 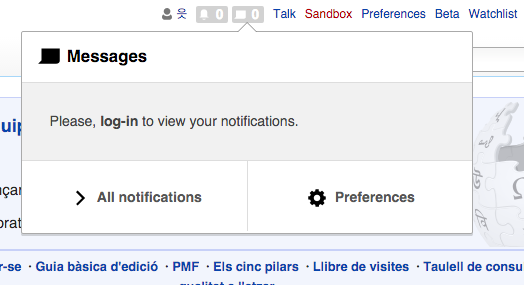 In that case, nothing will happen -- the notifications will not be updated, but also the popup will not be empties. This was done so that the user can still click their notifications and go to wherever they lead even if their session is lost. However #2, that means that "mark as read" and all the other operations that require logging in are ALSO not working, and we currently don't have any user-facing messages or indicators that tell the user something's wrong. So what to do in those cases? Do we want to have an extra "fake" notification at the top if the user reopens the popup and is not logged in? In that case, should we also hide all the action "mark as read" buttons? I'm leaving this for your consideration and design! I'd like to help but not sure a) about button styles and b) what exactly the error message is meant to accomplish. Would it be along these lines"
Please log in to your [Wikipedia?] account? I know the message was already there and not changed as part of this ticket/patch but I just saw it for the first time. It not a big deal I'm just mentioning it as a suggestion. Yeah, I tend to agree with you both, but I think that if we do that, we should change the current message for consistency. The reason I went with the current message is because I saw that was the one being used when/if the user is not logged-in in Special:Notifications. It's more or less the same idea as the popup, so it should probably be the same for consistency. I agree it should change, but I think we should change the message so that both use cases have the "nicer" phrasing and login link. I agree with @SBisson, I'd prefer a positive message. I'd suggest turning the background of the item to be light grey (#F1F1F1, as read items) to make it look like an empty panel with a message in it, not like a notification. Also, the item would lead to the log-in page when clicked (I used bold to emphasise this instead of using a link). We could add a grey version of the logged-out icon we use on Flow (T110086#1591975) for consistency, but that may not be a high priority considering this is an edge case. Perfect, I'll work on that. My initial plan to unify the messages failed; the original message I saw (and used in this commit) is the message that appears at the top of the login screen, and it can't have parameters. It also makes no sense to have a link to the login because of that. I've created a separate message, but adding a link internally within the message also proved a bit of an issue, because notification items are now designed to not have clickable text links -- so, incidentally, the design that's the easiest to implement is the design @Pginer-WMF shows in the screenshot, where the text is plain but the notification itself is clickable, going to the login screen. Working on that now for this commit. If we have a colored link, it should be progressive, not constructive, because they're not instantly logged in when they click it. The patch is ready for re-review according to @Pginer-WMF's design. The UI-Standardization is working on design guidelines. As far as I know, presenting errors and the tone of their copy has not been covered yet. @violetto and @Volker_E may have something in mind for upcoming quarters. The user warning "Please login to view your notifications" is displayed along with unchanged link 'Log out' indicating that a user is still logged in? For such cases - a user logs out, but still 'logged in' in different browser/tab - a user won't have normal warnings about IP address being displayed when he attempts to edit Flow pages. Non-Flow pages properly display the warning. Attempting to thank - 'Thank action' failed' is displayed. Yes, the top-left link is controlled by core and is only updated at page load. So if they log out in another tab, or their session expires, it will not be updated until they reload. I reviewed T60696: Flow: It's too easy to accidentally edit when logged-out and filed T122536: Users with expired user session should be warned that their IP address will be recorded to list specific cases when user warning is not displayed.